HTC has upgraded its ever-popular Sense UI for Ice Cream Sandwich (Android 4.0) and made quite the song and dance about it. There are improvements to the camera which it hopes you will write home about ("Dear Mum, My new phone camera autofocuses quicker than the blink of an eye! "), greater Beats integration than ever before and an easier system for arranging your homescreens. 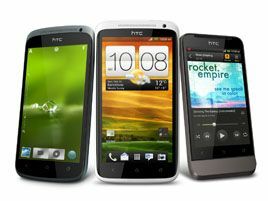 The Sense improvements are to be found on the HTC One X, HTC One S and HTC One V, announced this week at MWC 2012, but HTC is staying tight lipped on whether or not we can expect to see the improvements come to any older handsets. First up, there's a new look to get to grips with – and we like it. The company has tightened up the design of homescreen widgets in Sense 4.0, as well as doing away with those cutesy animations that you got sick of after unlocking your phone three times. Arranging your widgets and apps across the home screens is as easy as long-pressing an empty area of the homescreen and zipping the bits to where you want them. Next up is the Beats integration – now you can enjoy Beats-enhancement to any sound you play through your phone, including movies, internet radio and music streamed from a service or app like Spotify. We didn't have much of a chance to play with the Beats enhancements – partly because we were at a trade show surrounded by people with a background roar even Dre would struggle to compete against – but we did get a demo of a song playing first with the enhancements and then without (you can flick an onscreen switch to do away with the special musical sauce if it's not your thing). Beats adds bass and warmth to the playback, although we'll reserve our full judgement until we can review the upgrade properly. HTC is also grouping these like-minded music apps into one music folder automatically (presumably using metadata or an app's description to decide what's appropriate) so you're left with one music hub. Moving on to the camera, HTC has made no secret of the fact that it wants you to ditch your compact and use your One device as your, er, one device. So Sense 4.0 comes with a bunch of improvements to the camera UI along with a few hardware upgrades. Opening the camera app takes under a second, which is pretty good going. Apparently switching between video and still image shooting was proving a bit taxing for some, so the biggest change is that both options are now present onscreen when you open the camera up, and you just hit whichever you want to use. Even if you choose to film first, you can take still shots while the filming continues (and you can also do this during video playback too). Burst mode or continuous shooting is also made easy as pie by simply holding down the shutter button. Once you're done, you're given the option to choose which shots to keep and which to discard. You can keep them all if you want, but you don't necessarily have all that much memory to play with so be wary of that. Other handy bits to play with are the autofocus (which is faster than the blink of an eye and HTC can prove that with science) and the intelligent flash, which fires at a certain power level depending on how close or far your subject is from the camera. Put simply, we like what HTC's done with the place. Some may bemoan the loss of the extraneous animations, but the nifty upgrades to the camera and audio should fill that gaping hole in your smartphone life. Overall we like the simplicity of Sense 4.0. That, coupled with the power of Ice Cream Sandwich and the smart new hardware the whole shebang comes with, means HTC is once again a smartphone force to be reckoned with.